Last month, the National Spherical Torus Experiment (NSTX-U) was reopenend at the Princeton Plasma Physics Laboratory (PPPL), after a $94 million upgrade. Despite the lack of any concrete scientific evidence, there seems to be no lack of funding for unproven technologies such as Andrea Rossi's eCAT. Recently, we have seen multiple initiatives that were launched to push down the scale and cost of a fusion reactor, to work towards a commercial reactor that is cost effective. With ARC, a team at MIT adds one more compact tokamak design to this list. Being in space for 5 years, NASA's SDO telescope has delivered beautiful images showing with incredible detail the fusion star on which all our lives depend. 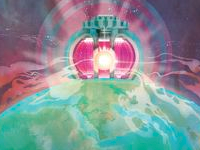 In an essay, Yale University student Jason Parisi makes a case for fusion power and pleas for a swift transition to reduce proliferation risks. 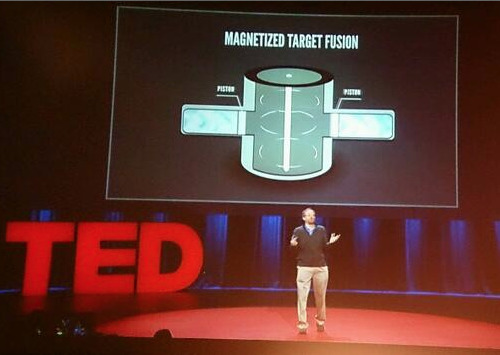 At Vancouver's TED2014 conference, General Fusion director Michel Laberge presented his company's research approach for building a Magnetized Target Fusion reactor. The New Yorker published an extensive article on the ITER project, with an historical, political an technical perspective on the events that lead up to project and the steps ahead to achieve commercial fusion energy. BP has published a new edition of its Energy Outlook 2035 that shows global energy consumption keeps growing, but with its rate slowing down and even declining in developed countries towards 2035. Despite a dubious track record of its inventor and repeated critics on tests of the device, a US company from North Carolina has bought all rights to the E-Cat technology. 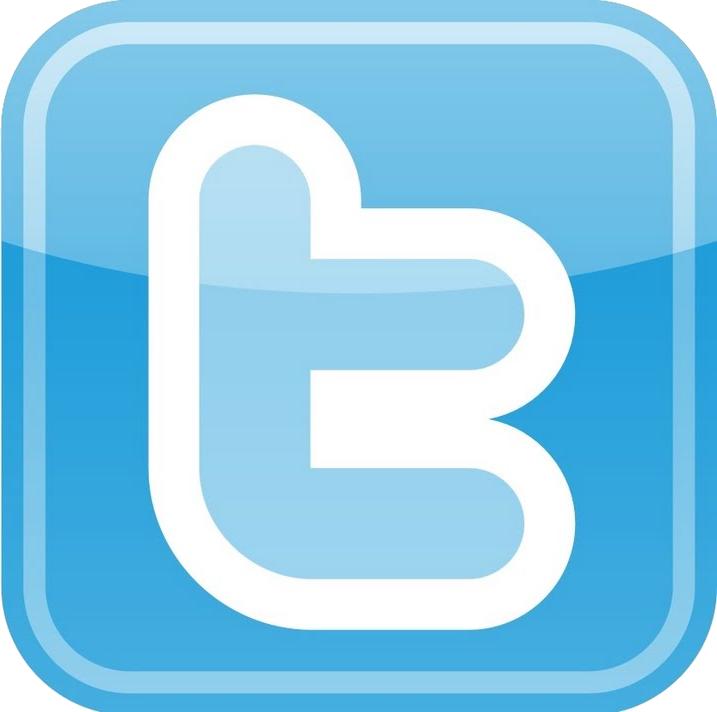 An unrivaled scam or a revolution? Build ITER with only 498 components! 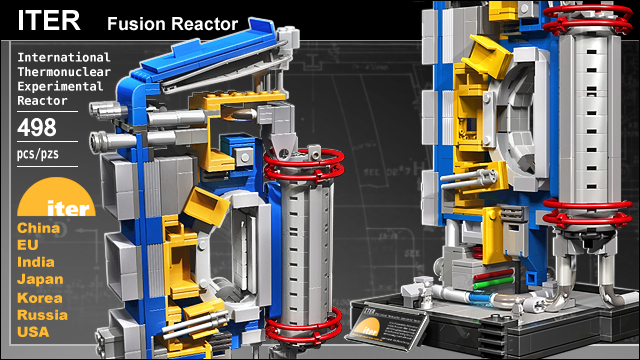 A proposed new Lego model showing a segment of the ITER reactor consists of 498 components, and - with your vote - it might become reality well before the estimated one million components of the real thing will be put together! Read more about Build ITER with only 498 components! At the Ecole Polytechnique Palaiseau in France, a new record in aneutronic proton-boron fusion was achieved with a novel two-laser setup, yielding at least 100 times more fusion reactions than any previous proton-boron experiment. The "Energy, Materials and Systems" research group at the University of Twente in the Netherlands has achieved a breakthrough in superconducting magnet technology, which could be important for future tokamaks. TFTR celebrates the fact that two decades ago, they reached a world record of 3 MW of fusion power in their first D-T campaign. The record was exceeded four years later by JET, when it reached the 16 MW power that is still the record today. Experiments indicate lithium coatings perform better as wall material than expected from previous models. The novel vapor-shielded regime could also be beneficial for the potential use of liquid lithium as divertor target material. 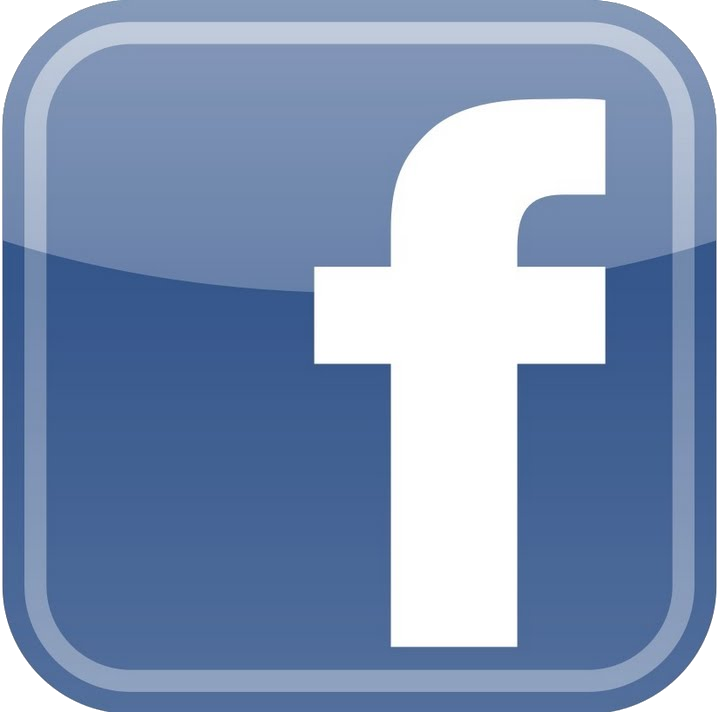 On October 7, 2013, the BBC news website released a report that stated that the National Ignition Facility (NIF) had passed a 'nuclear fusion milestone'. But what exactly is the milestone, and is it the breakthrough other media report? Researchers from University of Washington and research company MSNW are paving the way for fusion driven space journeys. 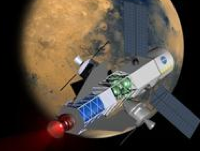 Fusion-powered rockets may open the possibilities for traveling into deep space. At the recent Google “Solve for X” conference on February 7, Lockheed Martin's long-term R&D department (“Skunk Works”) announced they are working on a compact fusion reactor. With what seems a 4th generation prototype called "T4", the aerospace giant says to have developed a high beta configuration, which allows a compact reactor design and faster development timeline. Simulations indicate cone-guided fast ignition is unlikely to work. A US-led research team showed that Oxygen plays key role in Deuterium-binding of lithium coated carbon walls. This understanding can improve hydrogen recycling of fusion materials facing plasma. 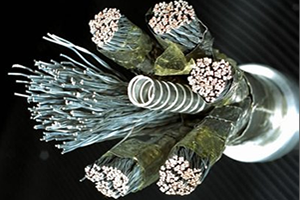 South Korea's National Fusion Research Institute (NFRI) will fund a pre-conceptual design study with the Princeton Plasma Physics Laboratory (PPPL) for K-DEMO, Korea's forerunner of a commercial fusion power station. Prof. Robert Goldston concluded that in H-mode, the motion of ions is dominated by non-turbulent drift effects. He used this knowledge to develop a model for predicting the width of the scrape-off layer in tokamaks. The director of the American Institute of Physics wrote an epistle on the advances in Fusion technology and why in times of budgettary constraints, the US and others should nuture large scientific endeavors such as fusion research projects. Martin Fleischmann has died on August 3, 2012 at the age of 85. Fleischmann and his colleague Stan Pons became famous for their cold fusion claim, now known as the Fleischmann–Pons experiment, but were later heavily criticized as the results could not be reproduced by other leading laboratories such as MIT, Caltech and Harwell. A team from the Culham Centre for Fusion Energy (CCFE) has spent the last two years assembling SNIF from second-hand components in a project the programme leader called a ‘scrapyard challenge’. SNIF stands for Small Negative Ion Facility, and was built to study alternatives for Caesium in enhancing negative ion beams for fusion reactors. Tore Supra is proposed to play a new role in the ongoing experimental search for axions in our galaxy's dark matter halo. In search for postulated dark matter particles, the tokamak's large volume and strong magnetic field are ideal, as they increase the chance of axions and chameleons that enter the cavity to convert into detectable single microwave photons. The refurbished SS1 tokamak of India's Institue of Plasma Research has now a closed shell and is nearing its final stages of commissioning. SS1 will be a medium-sized tokamak with superconducting magnets, and mean to research advanced configuration ('D' Shaped) plasmas. If all goes well, first plasma can be expected within a month. 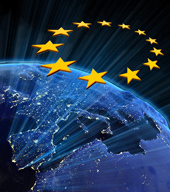 Martin Greenwald blogs on the history of fusion research and why, in spite of cricism that the ITER project is slow, inefficient and expensive, we should pursue fusion energy as power source of the future. As an expert Lego sculptor, Japanese artist Sachiko Akinaga has made an impressive LEGO model of the ITER fusion reactor. A blog from Bora Zivkovic shows the images of the model that was used as image accompanying an article in New Scientist on "The Problems with ITER and the Fading Dream of Fusion Energy", by Geoff Brumfiel. Ben Bartlett is a 17-year-old student that has made a $2800 table-top D-D fusion device should guide the outcoming neutrons in a particular direction. Although the concept has to be verified with measurements, he already made it to the finals of the world's larges precollege science fair in Pittsburgh, US. A physics team from The University of Alabama in Huntsville is assembling the equipment for a DM2 pulsed power generator. With the DM2 system they want to test a Z-pinch approach in an attempt to design a fusion-based rocket propulsion system. The specialized Z-pinch system would fuse lithium-deuterium pellets and use an electromagnetic field as a nozzle that the exhaust pushes against, while it also captures part of the energy to recharge the system. The U.S Navy is extending and it seems funding Dr. Robert Bussard’s IEC fusion theory at EMC2 with the eighth Polywell device called the WB-8: the official contract of an additional $5.3 million was awarded on May 03, 2012. 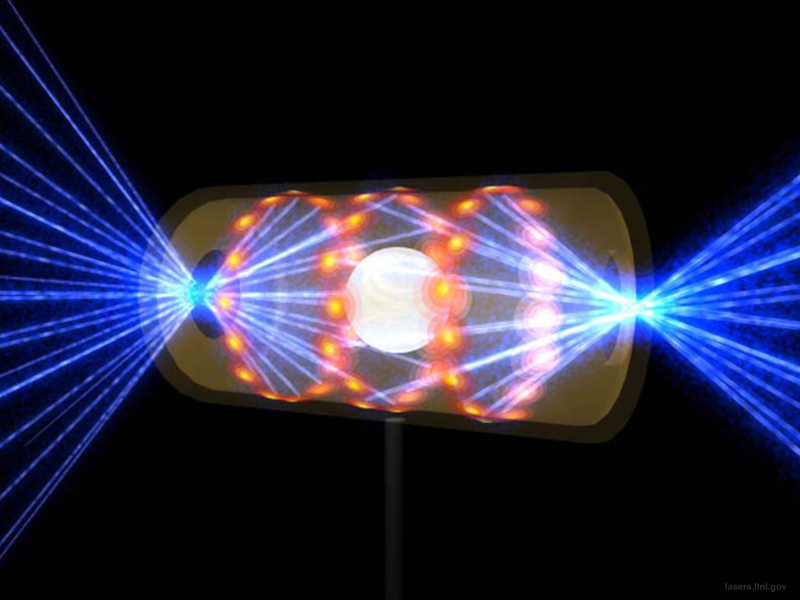 On its way to deuterium-tritium operation, ITER will experiment with a succession of "non-nuclear" plasma fuels. Read here the nice summary that Robert Arnoux has made on the long-term plans of ITER and the route to the first flux of high-energy neutrons in the end of 2027. In their quest to reach ignition - the National Ignition Campaign - the NIF lasers have set a record by delivering 1.875 megajoules (MJ) of energy that propagated to target chamber center. For her PhD work, Dr. Goretti Sevillano has embedded the ASTRA transport code into the Matlab/Simulink tool to facilitate suitable controller development for tokamaks. Fusion research would get a major boost in a Department of Energy (DOE) spending bill approved today by the U.S. House of Representatives Committee on Appropriations. Scientists from Princeton Plasma Physics Laboratory have reported on minute bubble-like islands that lay at the root of the “density limit” that can prevent fusion reactors from operating at maximum efficiency. A numerical simulation from Sandia Labs predicts a more efficient method of magnetized inertial fusion (MIF) that is now planned to be validated by experiments.